Sightseeing in Hakone is a lot of fun. 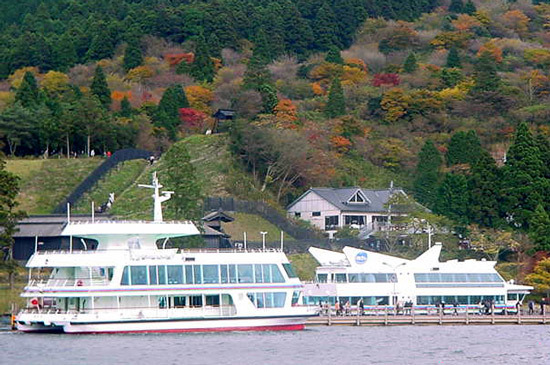 Along lake Ashi or Ashinoko(Japanese) are some exotic and luxurious cruise liners operated by Hakone Line. In the photo above are two of Hakone line’s sightseeing cruises ducked at Moto-Hakone to pick-up tourists and sightseeing passengers touring lake Ashi. In autumn(fall), the leaves on the trees along lake Ashi turns red, yellow, orange and brown with a mix of green. These mixture of colors is a must-see for tourists, this makes lake Ashi a very big sightseeing and tourist haven in fall. Another major means of transportation along lake Ashi is the replica pirate ships, kaizokusen. They are four in number: "Royal", "Frontier", "Victoria" and "Vasa". Get on the deck of one of these Sea Pirate ships and let the soft breeze from the lake blow away all your stress of city life.